Our first official look at Samsung's super-sized phablets. 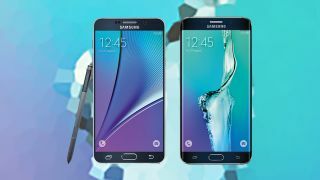 At Samsung's next Unpacked event on 13 August we're hoping to see the super-sized versions of the company's flagship phones: the Galaxy Note 5 and the Galaxy S6 Edge Plus. To help pass the time between now and then, cast your eyes over these official renderings of the new handsets, pushed out onto the web by the ever-reliable @evleaks. They don't tell us anything we didn't already know but if you wanted to know which images would be accompanying the Samsung press release, now you have your answer. Is the 21 August a hint at an on-sale date? Samsung's Galaxy Note series has long set the standard for phablet-sized devices, and the 5th edition looks like it won't disappoint. Rumours point to a 5.89-inch QHD screen, an Exynos 7422 processor and USB Type-C. The Galaxy S6 Edge Plus is more unusual and does for the S6 Edge what the Note 5 does for the original S6 - make it bigger. We're expecting a 5.7-inch QHD screen plus those distinctive curved edges. In a couple of weeks we'll be able to give you the official rundown. There's speculation that these devices are being launched early to steal some of Apple's iPhone thunder - not that Samsung would admit it, of course.